This study aims to explain and prove empirically the influence of transformational leadership style and Organization Citizen Behavior (OCB) to performance. The subject of this research is a nurse at Cancer Hospital “Dharmais” with one short study time horizon of 200 people. Sampling technique using proportional sampling with slovin method. The unit of analysis uses binary logistic regression. 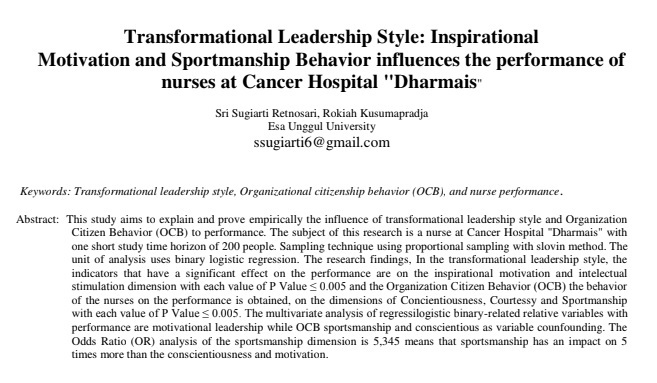 The research findings, In the transformational leadership style, the indicators that have a significant effect on the performance are on the inspirational motivation and intelectual stimulation dimension with each value of P Value ≤ 0.005 and the Organization Citizen Behavior (OCB) the behavior of the nurses on the performance is obtained, on the dimensions of Concientiousness, Courtessy and Sportmanship with each value of P Value ≤ 0.005. The multivariate analysis of regressilogistic binary-related relative variables with performance are motivational leadership while OCB sportsmanship and conscientious as variable counfounding. The Odds Ratio (OR) analysis of the sportsmanship dimension is 5,345 means that sportsmanship has an impact on 5 times more than the conscientiousness and motivation.